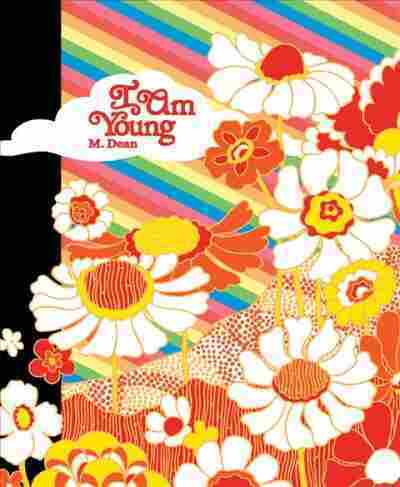 An Artist Looks Back — Way Back — In 'I Am Young' M. Dean's psychedelic collection of graphic short stories chronicles how music affects the lives of a group of young people in the 1960s and '70s, with masterfully nostalgia-invoking illustrations. I Am Young's retro vibe is heightened inside. Dean's imagery recalls a certain cute, rustic strain of '60s-'70s iconography; bitty patterns on quilts, rugs and wallpaper bring to mind Holly Hobbie and farm-girl chic. Dean's people have big eyes, Margaret Keane-style, and tend to resemble the couple in the "Love Is ..." cartoons. In a spread of a teen girl's room Dean really lets herself go nuts, drawing a dense tangle of must-haves-turned-memorabilia: a fringed leather purse, a turtle keychain, a peace necklace, a beat-up copy of Valley of the Dolls, an incense burner, a Goody hairbrush, a random decorative owl. Unfortunately, sentimentality is practically the only driver of these stories. The centerpiece tale, told in running episodes throughout the book, is about a couple who meet after a Beatles concert in the early '60s and then stay in touch over the decades. It's a corny premise, and neither of the characters is distinct enough to be anything other than an empty icon of youth and romance. In a strange disconnect, the drawings of the young lovers are dense and dark. Another long story, "Baby Fat," succeeds better. Its ennui-ridden heroine is no more appealing than the Beatles lovers, but her story is told through complex, experimental visuals that are unfailingly absorbing. Here and in other stories Dean tries out a dazzling range of graphical experiments. Strange arrangements of panels, deliberately crowded or empty compositions and contrasting color palettes enliven stories whose characters are rather banal. Even so, all these stories are most appealing if the reader happens to share their nostalgic mood. In "Nana," a nerdy girl and a popular girl bond over their love of Karen Carpenter. In "Strange Magic," a girl takes acid at Senior Prom and dances to ELO surrounded by imaginary ribbons of color. Dean's talent is expressed gloriously in her rendering of the acid trip. Most of the girl's drug-addled musings are forgettable, but she does have one charming, idiosyncratic observation about the witches of Salem. "They would have gladly been possessed or poisoned," she reflects. "How bored they must have been!" This book about the past makes you wonder what its author will do next. The most affecting story in I Am Young isn't about romantic love, but about friendship. High-school seniors Kennedy and Rhea both dig Tom Jones and want to be novelists someday. Kennedy is "my very good friend," Rhea declares solemnly. Instead of gossiping about boys, Kennedy and Rhea act out scenes from Hamlet and read Camus. Dean perfectly captures the anxious sense of portent common to brainy teenagers in every decade. The friends' greatest sources of tension are philosophical: They disagree about whether graduation is a significant milestone, whether Robert Redford is "plain" and whether there are such things as happy endings in life. "Maybe, even if she doesn't admit it, Kennedy is actually happiest knowing there are no real answers," Rhea says. The question is as vitally important to her as it is to every teenager with a reflective bent. People talk about nostalgia being bittersweet, but in Dean's case it's mostly just sweet. It's ironic that the best parts of her book are the ones that run counter to her rather cloying themes. While her characters sigh over their angsts, Dean's pen riots all around them. The effect is unintentionally jarring, but intriguing. This book about the past makes you wonder what its author will do next.